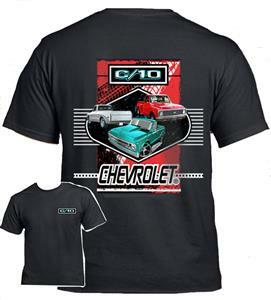 The "Chevrolet C-10 T-Shirt" features a large image on the back of 3 classic Chevy C-10 trucks in front of a stylised background. There is also a "Chevrolet C-10" logo on the left breast. This is printed on a high quality, pre-shrunk, 100% cotton Gildan t-shirt in black, and is fully licensed by GM.